I bought one of these on Saturday but haven't tasted it yet. Maybe I'll just give it a miss and send it to my curious KitKat-loving friend back home! It's interesting seeing these obscure flavours appearing, and yet there seems to be no sign of the most obvious potential hits (I'm waiting for a dark chocolate/coffee version). I think I'd actually love this--I have always loved the combination of lemon and ginger. I like mixing ginger ale with lemonade, too. Wish they'd have some of these Stateside, and not just in specialty import stores! 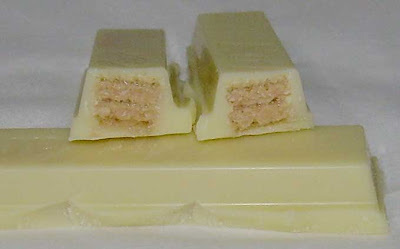 If I had a chance to pick a flavor, I would choose white choco with pistachios. So it didn't work with the chocolate for you? Hm, it still sounds like a tasting experience. I've only spent 10 days or so at a time recently in Japan, but on my most recent trip, I did notice that ginger ale seemed to be a choice at every (cheap) restaurant and karaoke place I went. I didn't spend a lot of time there to get a good idea, but it's rare to have ginger ale at restaurants in the US. 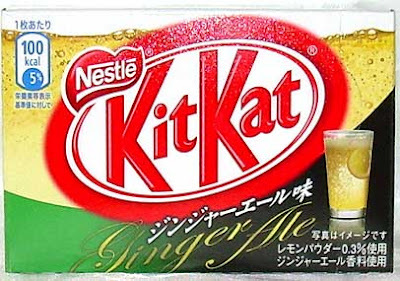 Hmm...I wonder if they would ever make a Coca-Cola KitKat. Actually, now that I think about it, it's probably been done. Re: ginger ale being everywhere (including cheap dives) - I think that's because it's used as a mixer for alcoholic beverages. I think the main reason neither my husband nor I liked this was the flat/stale ginger ale quality. A lot of the pleasure of a soft drink, particularly ginger ale, is in the bubbly aspects. Without the bubbles, it doesn't work so well (at least not for us!). Marvo: I think a Coca-cola one hasn't been done because it'd require some sort of deal with Coke, and I don't think Nestle Japan would make it since they're competitors in the soft drink business (Nestle with canned coffee and Coca-Cola bottling with their own canned coffee). I was surprised to see Canada dry ginger ale in Japan the last time. I'd love to try this though!